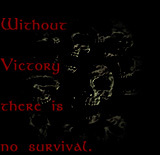 At the beginning of your upkeep, lose one life. At the beginning of your upkeep, you may return target creature card from your graveyard to play. That creature gains haste until end of turn. Remove it from the game at end of turn. 5 is the highest rating. This card is hard to analyze without seeing the rest of the Torment set. If the set makes it feasible to play heavy Black in limited... this card is a bomb. However in a traditional limited environment where you need to play 2-3 colors to have a competitive deck, coming up with the BBB part of the casting cost is very difficult. In constructed Dawn of the Dead is very similar to Corpse Dance. There WILL be decks built trying to abuse this card, especially with 187 effects becoming prevalent once again! Question: The way this card is worded... can you bring multiple creatures from your graveyard into play during the same upkeep? If so, this card is simply amazing! 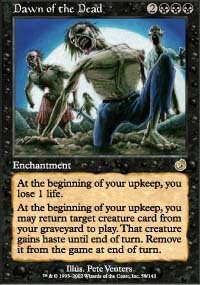 Either way, this card is one of the reasons they reprinted Buried Alive! This card has combo written all over it. I just wonder if it's viable. Things that sac, things that get in the grave fast...the possibilities are endless. It's expensive, and it hurts. Time will be the deciding factor here. In limited, it's a bomb I think. They kill your critter, it comes back for a suicide mission. Not bad. draft, but it'll never be the potential that it could be without that line. still a game changer, just not very good. Very, very solid in an environment where having a full graveyard is very, very simple. Yes, this messes with threshold, but that extra attacker every turn can really help stem the tide. Also, a creature with some useful ability can also be re-used. This card will be very abuseable in Limited. Turpish This card can add some serious late-game power to almost any deck using a good number of creatures and enough black to support the casting cost. It's really not a great fit in reanimator-type decks, because it is too slow. Something many people may not notice is that life loss is best used in decks that don't plan to make it to late game, though, and those decks would rather have another cheap, efficient, and aggressive creature in that slot. It probably will see some play, though. that do the same thing, only better. Since you didn't get enough reanimate or living death decks in extended you will now play against it in T2 (Yes, I said T2 because if you are old school there is no such thing as standard only Type 2 and don't sass a grouchy old man.) I can only think of about 400 ways to break this card. Combine it with the new 5 B Ritual, and Buried Alive etc you have some amazing black tricks. In Limited it is somewhat weaker but still very solid if you can get some fatties into the graveyard. Rating Constructed 5, Limited 3.5, Torment only 4. I just don't see it quite making the cut. have a fairly unplayable card. This card could be pretty interesting in constructed. You can build a deck around this that could be potentiall devestating. There are also some cards from Torment that might produce some good synergy. It might be costed one more Black mana than it should which could keep it from being overused. It's definitely nowhere near broken. In limited, unless I had already drafted a bunch of evasion creatures (or just wanted a rare) I might let this one float a bit. It can be useful late game, assuming you have the life to sustain it. Being able to get a creature back that has the ability to kill stuff could be good as well. Unfortunately, there are a lot of cards between Odyssey and Torment that require cards to be removed from the graveyard. not worthy of anything above 3.5. Magic the Gathering is a Registered Trademark of Wizards of the Coast. This site is not affiliated with Wizards of the Coast and is not an Official Site.